NEW CURRICULUM REQUIREMENTS will be in effect for those students beginning the program in FALL Semester 2019. The new changes, as well as the pre-Fall 2019 requirements, are reflected in the information below. Graduate level supervisory courses (BIO 5000, 6910, 6920, 6930, 6940, 6960) are not offered during Summer Semester. Please plan your schedules accordingly. 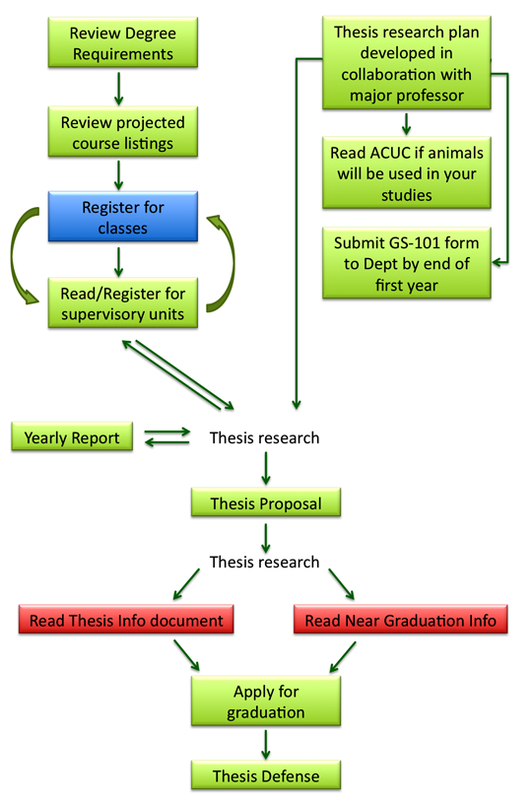 The Start-up Flowchart below is designed to aid students in their transition into the Biological Sciences Graduate Program. You are also encouraged to browse the Department of Biological Sciences website, as well as the University website for more information. Clicking a box will forward you to the information page pertaining to that step. 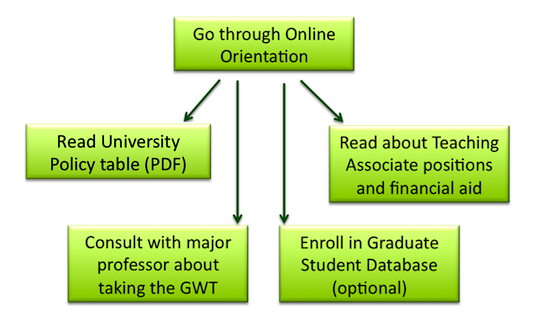 The Graduate Program Flowchart below is designed to aid students in the Graduate Program to plan their graduate careers and keep track of their progress. Please note that the flowchart is a guide and NOT a substitution for meeting regularly with your major professor regarding your plans and progress. Clicking a box will forward you to the information page pertaining to that step. How to track your degree progress during your time in the program. Students in all graduate programs (except Masters of Arts in Education) do not have to complete a Request for Graduation Check form. In lieu of having a graduation check, students in these programs will be able to access their Degree Progress Report . Once the approved Program of Study "Contract" has been received in the Registrar's Office from the Graduate Studies Office it will be reviewed by an evaluator and noted on the DPR as the graduation check. Course Recertification Policy and Procedure (for courses more than 7 years old). Waiver of residency - to graduate from the program without being registered for supervisory units (conditional eligibility). Student Learning Objectives, Assessment Plan, Assessment Data, Analysis, and Programmatic Response for the Graduate program. It is recommended that students read the FAQ page. You need Adobe Acrobat Reader to access PDF files. You need Microsoft Excel Viewer to access Excel files.